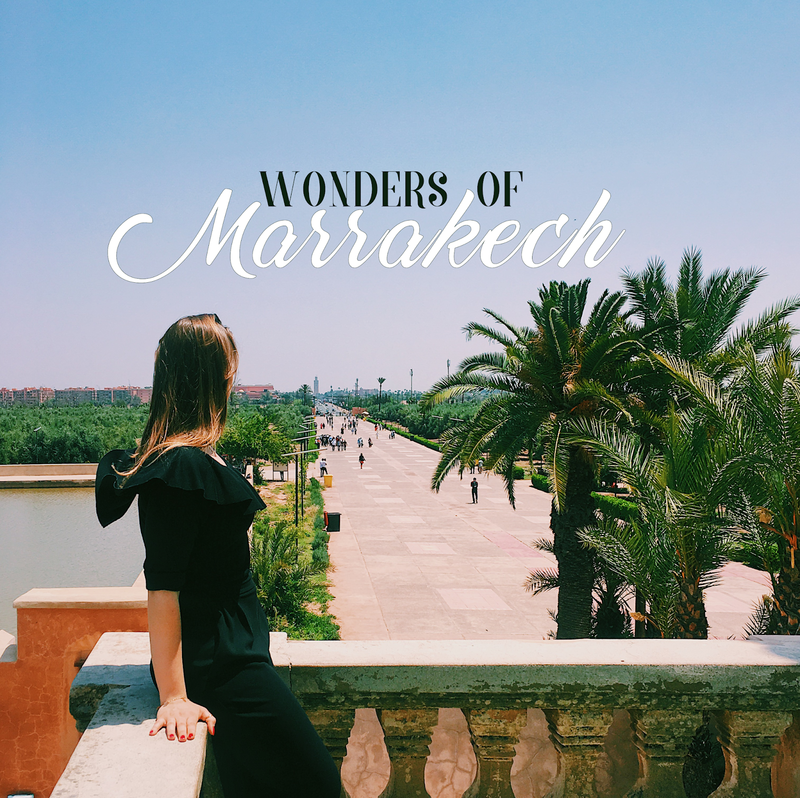 From the 10th to the 14th of May 2018 I had the extremely amazing chance to visit two cities in Morocco. It has been my first trip outside Europe and I've been finally able to check it out of my travel bucket list after dreaming about it for so long. Four days are definitely not enough to see all the wonders this incredible country has to offer, but that was the time I had available and honestly, better four days than zero! So come follow me in what this amazing trip has been to me. Landed from Geneva to Casablanca, I've met my friend Haamza at the Airport Mohammed V.
We drove to the city centre, where we took a bus of CTM to reach Marrakech, where we arrived at around 1 AM. We took a cab and we arrived at a very cute hotel, "Marrakech House". Street view of Koutoubia Mosque. Finally ready to discover Marrakech, we had breakfast with a "Omelette crevettes", omelette with shrimps, and Mint tea. Moroccan tea has been following me through the whole trip, I can't help, I love it. The first thing we saw, while walking to the old city, has been the "Cyber Park Arsat Moulay Abdeslam", a little oasis, that brought us immediately to the beautiful Koutoubia Mosque, which was absolutely stunning. Right after we arrived to the medina and to Jamaa el Fna, the famous market square of Marrakech. We wandered around the Suq, which was incredible, just as expected. I had then to buy some dates (because I'm addicted) that looked exactly as the one we used to give to our guests in the hotel I was working in London, so I could see they were just as amazing. Pastries at the Patisserie des Princes. That's when we headed to a place that a friend of mine advised me to go to: La Patisserie des Princes. Where to start... it is incredible. Moroccan pastries are just amazing, in particular if you love walnuts, pistachios, almonds, seeds and dates. You have to try at least one of each, but in particular the "Cornes de gazelle", "Chebakya", very popular during Ramadan, "Feqqas", "Sellou" and "Makroudh". And if you are wondering how the hell am I remembering all these names, I am not, I looked online for the sweets I've tried and now I am pretending I know them all. Ok, ok, I'm joking. Then, we went to one of the most beautiful places I have ever seen in my entire life, incredibly amazing and so well kept: the El Bahia Palace. I leave you some pictures from there before continuing, because yes, it is worth it. This beautiful representation of the Islamic and Moroccan style was built in the late 19th Century and its name means "brilliance". The garden inside the palace is also incredible and I believe you should really visit this place whenever you will travel to Marrakech. After the El Bahia Palace we walked to the Tombe Sa'diane, another amazing example of Moroccan art and style. In this mausoleum there are three main rooms, with the tombs of Ahmad al-Mansur and his family. The last day in the city, we only had the morning to spend in the city, as at 3PM we had the bus to come back to Casablanca. We therefore went to the Menara Gardens, an amazing stop for people obsessed with symmetry as me. Marrakech has been incredible, a place full of colours, life, perfumes and flavours. It satisfies everything you can imagine about Morocco, with its little streets full of artisans, food shops, handicrafts. It's evolving to adapt to the growing amount of tourism that it's incoming to the city, but its authenticity can still be found everywhere. Soon the following posts on what to eat (and where) in Morocco and what to see in 24 hours in Casablanca. © All the pictures were taken by me (and my amazing talented Haamza who learnt how to take amazing pics in just 1 hour).